Enlightenment activists from far east psychedelic underground. 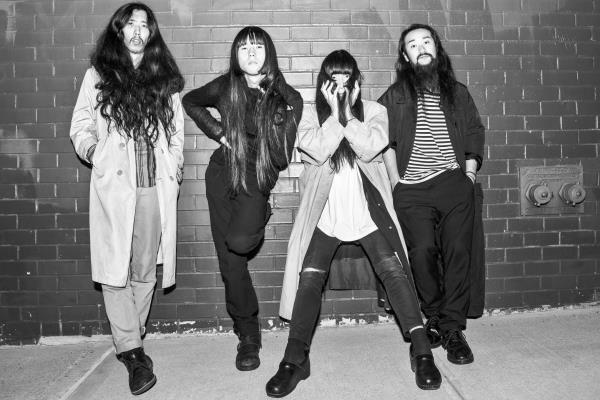 Bo Ningen are from Tokyo, Gunmma, Tajimi, Nishinomiya, but all met in London.In 2006 Taigen (vocal & bass) met Kohhei (guitar) at a gig and they formed the first Bo Ningen duo. It was more noise than a straightforward rock or ‘band’ sound and they performed only once – an improvised set (end up being thrown cups and cans). In 2007, Yuki (guitar) met Taigen they started to jam 10 hours a day in a studio in Hackney without any musical structure, they were later joined by Monchan on drums and the present day Bo Ningen was formed.Being ‘psychedelic’ means to us that stand quietly / loudly in the middle of interzone and stare at both sides at once. Baba Naga are shamen in a world where the existence of souls is denied. They offer worship for those who acknowledge the nihility of deities. The most fantastic and appalling tragedies are all real, horrors masked inside the sarcophagi of human myths and history. Baba Naga offer these stories in song, and give hopeless prayer to the people. The gods are dead, but the people need to worship something. The music is a peregrination from desperation to despair, channelled into euphoric, psychedelic, pagan gloom. The live show is moody, trippy, a sickening high without narcotics. Although the members of Baba Naga neither smoke the Devil’s herb, nor ingest psyychotropic drugs, their doomy, shoegazey gigs are often described as making people feel as if they are stoned.